Holley’s new trussed LS valley covers are the latest addition to our expansive lineup of LS engine dress up products. Machined from billet aluminum and featuring a modern trussed design, these LS valley covers are the perfect upgrade for your LS engine if you are looking for a subtly custom touch. 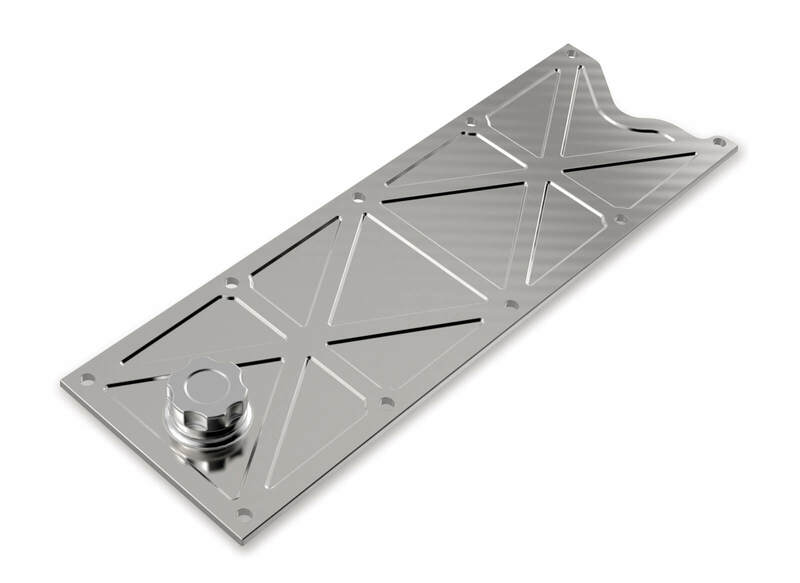 These valley covers are machined smooth on the underside, allowing for the elimination of Displacement-On-Demand (DOD), and instead feature an ample gasket sealing surface and provisions for re-installing the oil pressure sensor if necessary. Each valley cover is custom machined for either LS1/LS6 (10 bolt) or LS2/LS3/LS7/LSX (11 bolt) patterns and Holley / Mr. Gasket offers all the necessary gaskets and upgraded hardware options to complete your installation. The new Trussed LS valley covers are available in three unique finishes: natural billet (clear anodized for protection), polished billet, and black anodized billet.